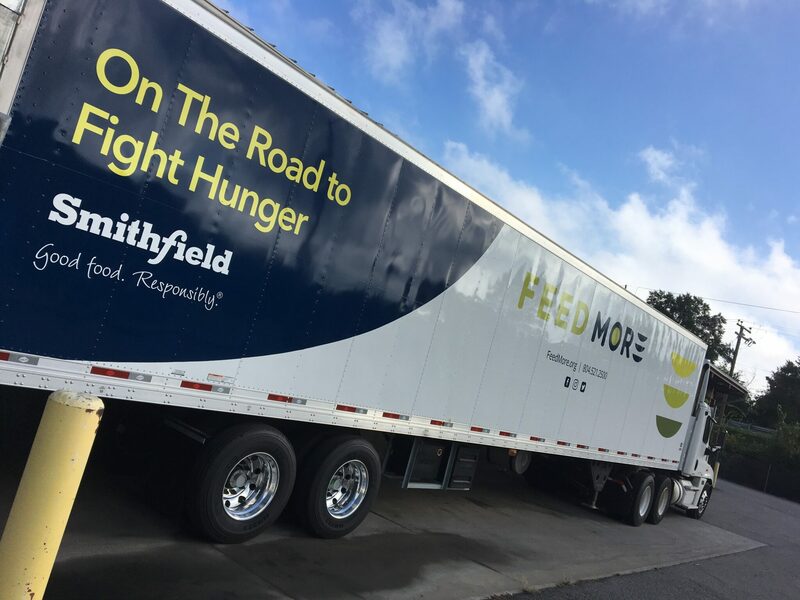 Home / Blog / Smithfield Foods provides new tractor trailer to help Feed More. Smithfield Foods, Inc. and Feed More, a hunger-relief organization serving 34 cities and counties in Central Virginia, unveiled a new refrigerated tractor-trailer to support the organization’s efforts to improve product distribution to the eight-localities in the southern region of their service area, where almost 25,000 individuals are food insecure. The tractor-trailer was funded through a $180,000 gift from the Smithfield Foundation, the philanthropic arm of Smithfield Foods. The new tractor-trailer will deliver between 20,000 to 30,000 pounds of food each day from Feed More’s Richmond campus to food pantries and other members of their Agency Network and remote distribution centers. This will be focused on rural localities across Feed More’s service area, including Brunswick, Charlotte, Emporia, Greenville, Halifax, Lunenburg, Mecklenburg, and Sussex counties. Since 2011, Smithfield has donated more than 300,000 pounds of protein through its partnership with Feed More.